Guests and residents seeking some of the most utterly ravishing views of the bay, ocean and the city should consider a condominium at the Floridian. Situated near the heart of South Beach near the pristine waters of Biscayne Bay, the Floridian’s sublime vistas are only a small sampling of what the building offers within its 32 magnificent stories. 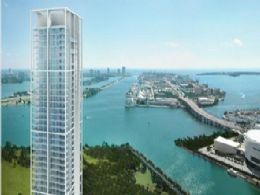 Individuals who decide on the Floridian will be staying at a true full-service luxury condominium. 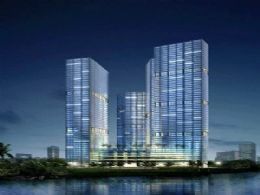 The concierge, valet, parking and security services are accompanied by a workout facility that includes steam baths and his and hers sauna rooms. The health spa is managed by a professional staff who are more than happy to indulge your health and relaxation needs or you can unwind by taking an in-line skating tour or bike ride throughout the city by taking advantage of the Floridian’s rollerblade lockers and bicycle storage conveniences. Additional conveniences include a fully-equipped business center, secluded conference rooms, and entertainment and media facilities. All this is luxuriously offered with prime aesthetics such as flourishing tropical landscaping and a delightfully scenic bay walk. Besides the fitness facility, residents who seek a variety of physical activities can also take advantage of the tennis court, personal fitness services and yoga and spin classes. Even a convenience store is offered on premises, reducing the frequency of required trips to the market and thus allowing more to indulge in the Floridian’s matchless views and exciting amenities. The Floridian offers 334 total units available in one to three bedroom choices, each designed for superb outside views from their private balconies. Within the residence you’ll have the convenience of broadband pre-wiring, roomy walk-in closets with ventilated shelves, washer and dryers and gourmet kitchens with granite countertops and stainless steel appliances. Bathrooms feature deluxe ceramic tile, marble flooring and select stall showers. Along West Avenue you’ll find popular restaurants and coffee shops like Starbucks and an additional variety of shops. Venture towards Lincoln Road and discover the long strip of indoor and outdoor eateries, art galleries, theater and chic boutiques whilst soaking in the local lifestyle and the menagerie of pampered pets that are often seen wearing the latest fashion collars and clothing from South Beach’s own pet mall, the Dog Bar. All this excitement is available to you within walking distance from the Floridian. Slate roofs are also very attractive, with a natural look that enhances a homersquo;s overall curb appeal. Donrsquo;t believe the myth that slate roofs are noisy as a roofrsquo;s underlayment and other materials absorb sound and keep a slate roof quiet, even in inclement weather. A cool or white roof is a reflective coating added over roofing materials. The lighter color of a white roof helps to reflect sunlight and keep a home cooler in summertime. Not only does cool roof lower your air conditioning bills significantly but it can also reduce wear and tear on the roofing materials underneath it. Overexposure to harsh sunlight and heat often cause asphalt shingles and other roofing tiles to become brittle and crumbly, leading to premature cracking, splitting, and otherwise unnecessary repairs, whereas a cool roof helps avoid that damage. The experts and local roofing contractors in Boston note that many homeowners mistakenly assume that a metal roof is heavy and might damage a home, but this is not the case. Metal roofing tiles are lighter than shingles and an excellent option for older homes and structures that have weakened with age. Synthetic roofing materials, including plastic, rubber, and other polymers, are increasingly popular with homeowners today due to their low cost, lighter weight, and durability. Synthetic roofing materials are shaped and formed to resemble other materials including wood and slate, and are often highly fire-resistant. Solar shingles can be somewhat costly and itrsquo;s good for homeowners to note the pitch and angle of their homersquo;s roof and how much sunlight the shingles might realistically absorb throughout the day. Remember, too, to check for rebates, tax credits, and other incentives that help to offset the cost of solar shingles when deciding on a new roofing material for your home. The downside of concrete roof tiles is that they are often heavy and cumbersome to install. Not every home is a good candidate for concrete roof tiles and their installation might require a specialty contractor, so keep those considerations in mind when shopping for a new residential roof. A green roof combines soil, compost, and living plants to create an actual ecosystem on a homersquo;s roof Live plants on a homersquo;s roof adds a protective layer of insulation between the house and outside elements, keeping a home cooler in summertime and warmer in winter. A green roof also improves surrounding air quality since plants clean the air around them naturally. Some homeowners even grow edible vegetation on their homersquo;s roof, reducing their grocery bills as well as their utility costs. While green roofs have many advantages, they are best suited for sloped roofs, to allow proper water runoff and to prevent water pooling on the homersquo;s roof. No matter the residential roofing material you choose, todayrsquo;s homeowners have more options for color than ever before. Roofs in a red tone offer a rustic charm while a dijon yellow roof can add a splash of subtle color above a white home. Roofs in a slight blue tone are an excellent option for homes painted blue, as the color is often difficult to match and complement. nbsp;Sean King is a leader in the industry and offers full roof replacements using the best materials. His New England based company, Risk Free Roofing Boston has changed the industry by never asking for deposits, installing roofs in a day and giving quotes in 5 minutes or less. He also warranties his roofs for the entire lifetime of the home. The rental income can come from a primary residence or a second home, and primary residences, vacation homes, and investment properties can all be refinanced under the program. The Vrbo partnership with Quicken comes on the heels of competitor Airbnbrsquo;s announcement last year that itrsquo;s working with both Quicken and Fannie Mae to ldquo;allow anyone who has rented out property on Airbnb for a year or longer to count some or all of that money as incomerdquo; when applying for a refinance, said MarketWatch. But just how do those two contingents break down? The National Association of Realtors NAR 2019 Profile of Home Staging provides some insight. The study separated the study into three categories: Buyersrsquo; Agent Perspective, Sellersrsquo; Agent Perspective, and Buyer Expectations. Wersquo;re taking a closer look at the key points. Per the study, ldquo;28 percent of sellersrsquo; agents said they staged all sellersrsquo; homes prior to listing them for sale,rdquo; and ldquo;13 percent noted that they only staged homes that are difficult to sell.rdquo; The living room 93 percent, kitchen 84 percent, master bedroom 78 percent, and the dining room 72 percent were the most commonly staged rooms. Of course, time on market and sales prices can range depending on a number of factors, like age of home, location, square footage, and price point. The Real Estate Staging Association has found, overall, that staged homes sell ldquo;73 faster, on average, than their non-staged counterparts,rdquo; said The Mortgage Reports.